The ultimate retreat for your mountain get-away! Perfect for the family or a romantic get-away. This comfortably furnished, Non-Smoking, two bedroom, two full bathroom, cabin home is nestled on the banks of the widest portion of the Nottely River. Relax outside and enjoy the soothing sound of the river flowing by from the porch, complete with outdoor furniture and barbecue grill for cooking outdoors. There is plenty to see and do, from top notch fishing from a stocked river to nature walks or just taking it easy, but for those looking to venture out, try whitewater rafting at the Ocoee or Nantahala River. Motorcyclists can enjoy our epic Mountain highways and woods riding. You may consider just heading into town and enjoying some of our local interests. our Chamber of Commerce, is always happy to provide you with endless information on area attractions and points of interest. Minutes from John C. Campbell Folk School. Keywords: Single Level Cabin, River Front Location, John C. Campbell Folk School, wifi. We are a single level cabin. offering secure wireless Internet, New 55' Flat Screen Smart TV, King bed, Ceiling Fans, Central Air Conditioning and Heating, Coffee Maker, Board Games, Outdoor 'Fire Pit', Outdoor BBQ Gas Grill. Very peaceful cabin right on the river. Cabin was very clean and had everything we needed. We really enjoyed our stay and would stay again. We throughly enjoyed our stay. The river was so peaceful to listen to. Tried fishing without success, but was fun anyway. The cabin is very well equipped & comfortable. We had several rainy days, but the large covered porch allowed us to be outside despite the weather. And our dog LOVED jumping in the river. Would definitely stay again. Lovely cabin with everything you need, directly on the river. Peaceful and quiet. Had a great time. Caught trout practically off the back porch. Very secluded, yet close enough to town. We will be back, I hope. peaceful and beautiful. We enjoyed watching the geese go up and down the river each day. My husband caught rainbow trout. We have already booked for next year and are counting down the weeks! Had a wonderful stay. Beautiful property. Loved exploring the area. Murphy is a great town. My dogs loved the river. Would strongly recommend. Wonderful rental. Beautiful and simple home but plenty big enough for the five of us. Loved the river in the back yard and the quiet stillness that it provided. Much enjoyed and needed break from work and school. Although the river was cold, we did go in it - up to our knees - and enjoyed the neighbors' dog Sadie as well as she jumped into the water to fetch sticks. Enjoyed the ease of access as well even though the house was in amongst the woods. Hoping to rent it again in the summer to take full use of the river! The town of Murphy is nearby so while the house is free from car/motorcycle/airplane noise, it's not too far to make the drive into town a long one. Murphy itself is quaint and cute as well and we enjoyed it also. We told some friends about this place also and hopefully we don't have to fight them for our next rental here! PLEASE READ: We are a weekly rental Cabin. Checkin at 3pm Saturday to Checkout at 10am Saturday. Please provide a minimum 14 days notice to book a rental date. We are limited with last minute rentals. Cancellaton Fee may apply. 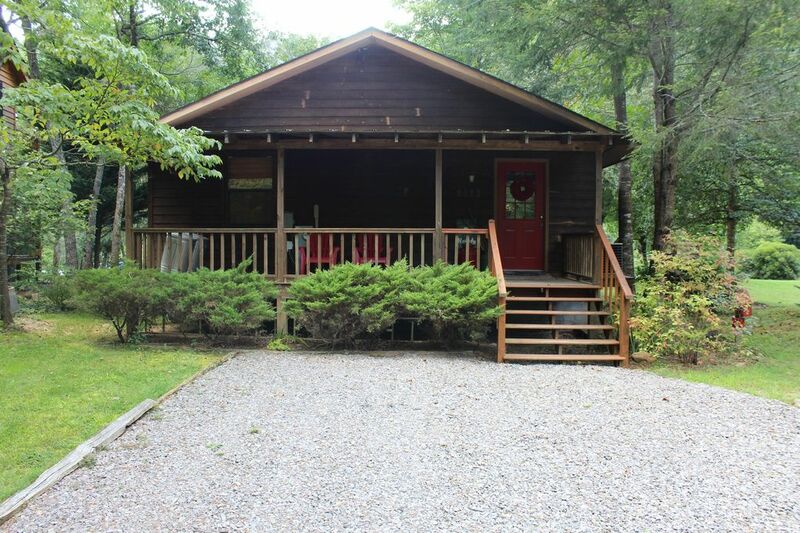 Cabin is very well maintained so you can expect an enjoyable home away from home experience.